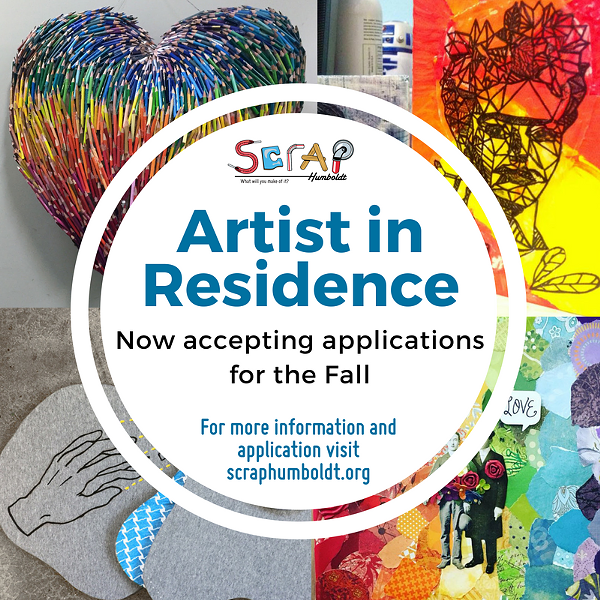 SCRAP Humboldt is seeking artists to apply to their two, two-month long artist residencies this fall. The program will provide the time and space for artists to develop a body of creative reuse work and creatively explore new ideas as they are challenged to reimagine everyday materials from accordion folders to zippers into works incorporating a minimum of 70% creatively reused material to be shown in an exhibition at the end of the residency. SCRAP is looking for professional, emerging and students artists who work in any medium. Applications can be found at scraphumboldt.org and are due by August 15th.